Often nicknamed the Indian Church in Iceland as it kind of looks like huge Tipi Tent, at least from the outside. Breidholtskirkja is located in the Breiðholt suburban in Reykjavík. The church is white at the bottom and black at the top with a thin silver cross at the top. The inside is covered with complete wooden panel and has an orgel in a similar shape to the church itself. You will often drive past this church when exiting the city to the South Coast. Laugarneskirkja could easily be used as an example of an Art Deco building. It is unusually high on an Icelandic standard and definitely stands out. The combination of its art deco architecture, its height and its isolated location make sure of it. The architect of the church was Guðjón Samúelsson who is the man behind the famous Hallgrímskirkja, the National Theatre and the University of Iceland. Laugarneskirkja is beautifully lit up in the evening and is especially impressive in wintertime. The inside is very simple yet elegant. Háteigskirkja is a 4-towered church in central Reykjavík. It has stunning dark peaked towers, two higher but those are the clock towers. The inside of the church is very open and grand and there are fantastic mosaic art pieces all around the church. If you visit you should pay special attention to the glass windows! The church was built in 1957 and the first priest started working in 1964. There is a lot going on in the church still today and you can often go to concerts and plays in the church. Now, this is a special one. Viðeyjarkirkja is located at a little island right outside the Reykjavík bay area and can actually be seen from the city. The name is taken from the island it sits, which is called Viðey. The church was built from stone during from the year 1967 to the year 1774. It was designed by a famous Danish architect named Georg David Anthon. 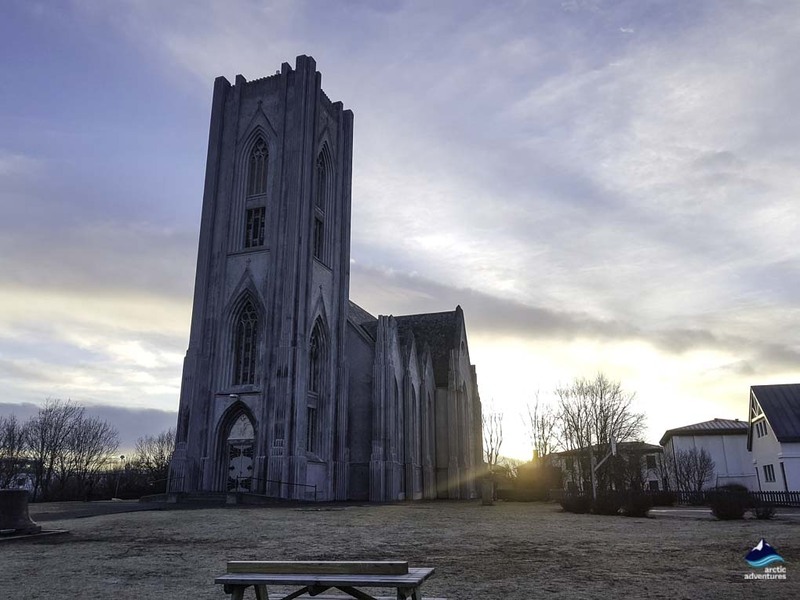 Viðeyjarkirkja is the second oldest church in Iceland but archaeological findings have proved the existence of another church before this one, likely built in 12th century. Viðeyjarkirkja is a simple building, shite on the outside with a small black roof. There is no designated church tower but a simple open clock box right at its center. The main door into the church is painted in a beautiful blue-green color which has proven to be very photogenic. The inside is quite surprising as it is very much in style with the old turf churches you can find scattered around the country. The altar is made from wood and painted colorful blue, green and red colors. The seats are the same, simple and made from wood yet painted in colorful blue, green and red. 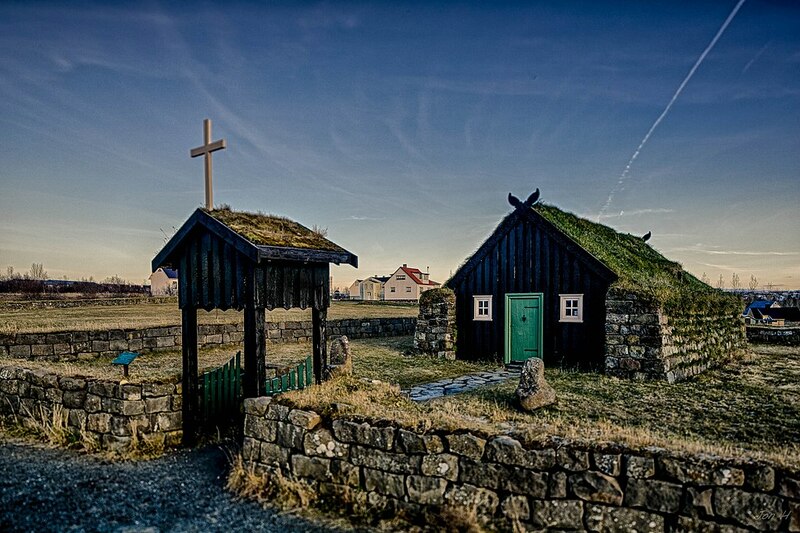 The turf church at Árbæjarsafn Open Air Museum is a part of the small wooden house village that has been raised up in the hill. The surrounding houses are colorful but the church is black with white frames around the windows. Its door is in a green color very common for black wooden houses in Iceland. It is small in size and the ceiling is not high still the church is used for weddings and other ceremonies and people love it! It is a very typical turf church and makes you feel like you have just stepped back in time. Brautarholtkirkja actually belongs to the Kjalarnes are but it is within the municipality of Reykjavík so it is fully qualified for this list. The churches unusual coloring and its childlike yet gorgeous artwork inside is why it is number five on this like. It stands completely alone and its black colors make it pop out in the grass field. The church has a green roof and white framed windows and front door. The church tower stands out like a hat on top with and additional thin cross. As you enter the church you first see the wooden seats which have been painted in brown and blue but the further in you go you start to catch a glimpse of the ceiling which has been painted in light blue colors. To add to the fairytale-like scene the ceiling also has golden stars. The altarpiece is uncomplicated, a painting of Jesus on top of a green wooden counter. 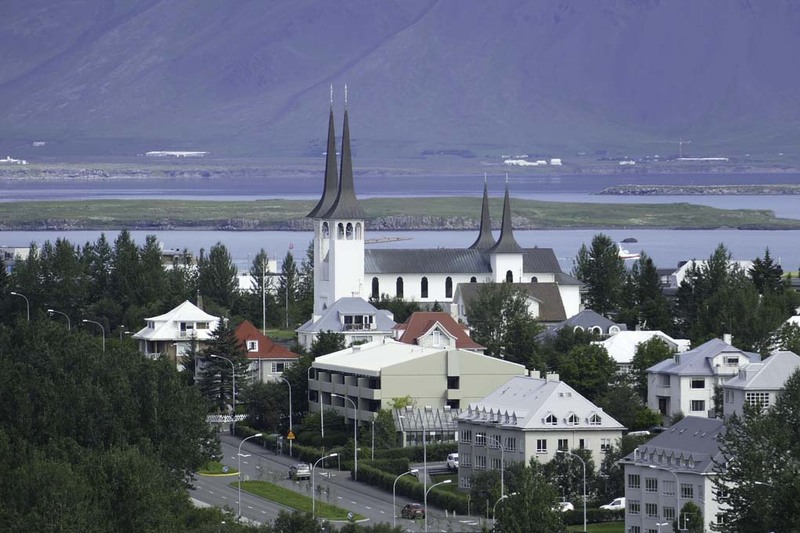 Dómirkirkja or Reykjavik Cathedral is nothing like other cathedrals you are used to in big cities around the world. It is much smaller and definitely not as extravagant in decorations. 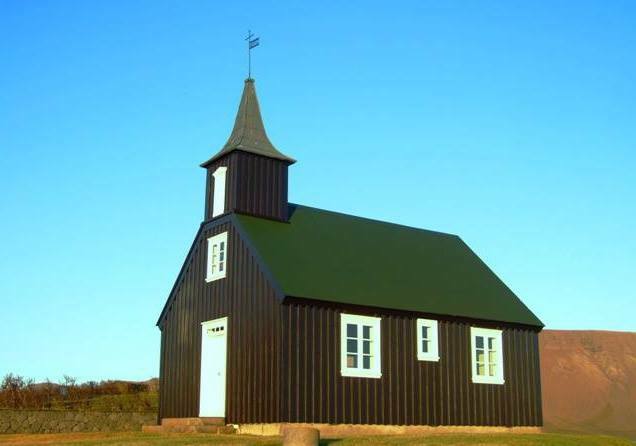 Even so, it is to many Icelanders one of the most sacred churches in Iceland. 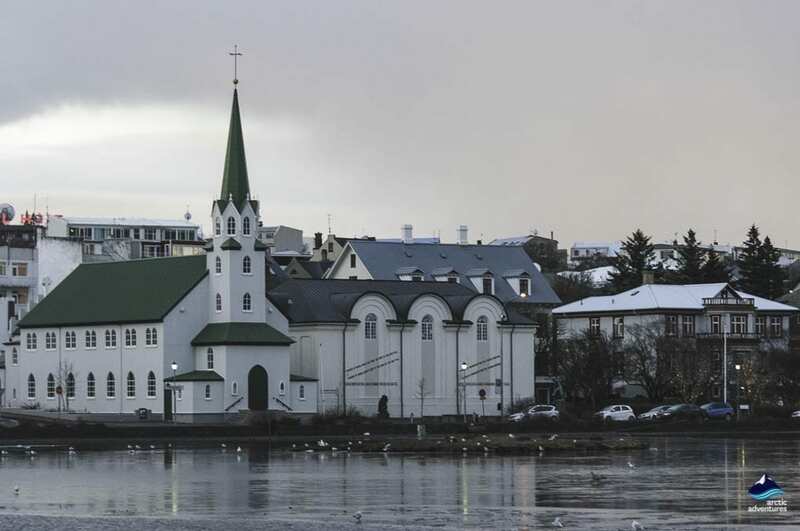 It is where the people in the Icelandic Parliament join for mass before starting a new session and it is where the Christmas mass is broadcasted from. The architectural style is neoclassic and the church was built in the 18th century. It was built in a hurry and the workers drank a lot during the process, this has led to a lot of fixing and rebuilding of the church throughout the years. The church isn’t much to look at from the outside but once you enter the divine paintings, the altar, the incredible organ, the baptismal font and the wooden balcony take your breath away. This is truly one of the most amazing churches in Iceland. 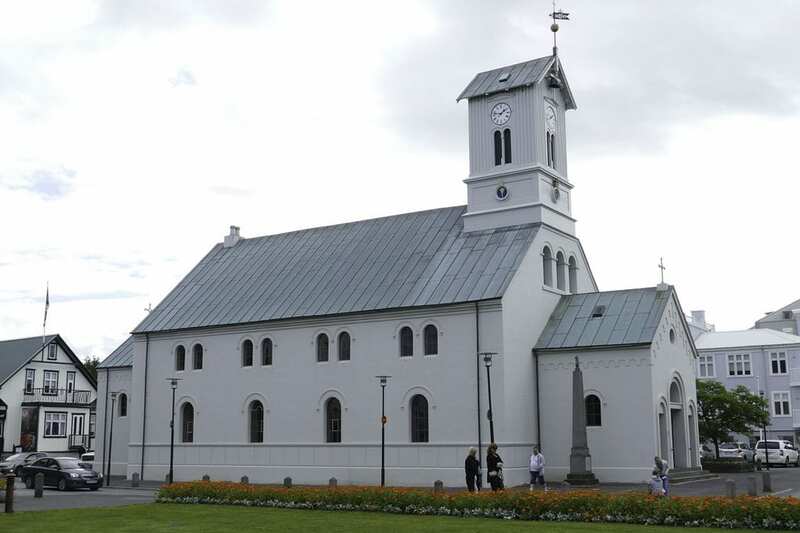 Landakotskirkja is located in downtown Reykjavík and is the only Catholic Church in this area. 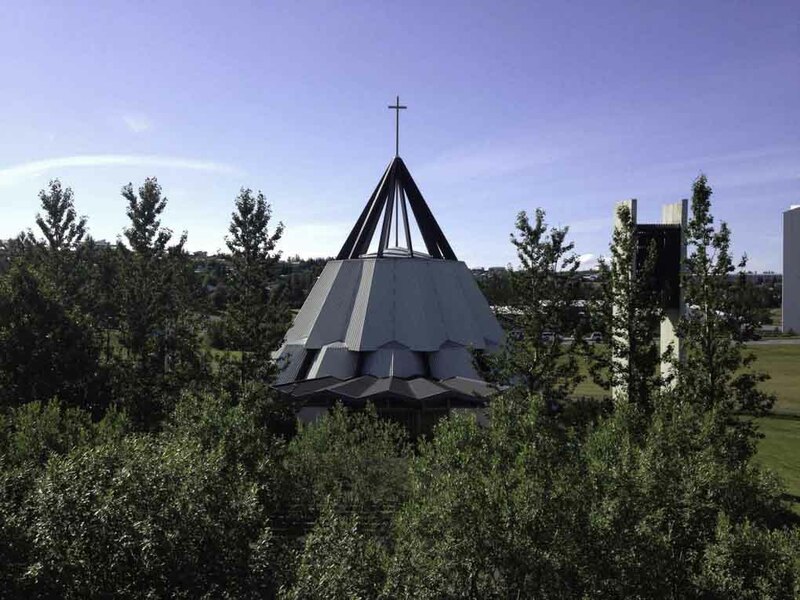 It is known as Christ the King Cathedral in the Catholic community in Iceland. The church stands out very clearly in the neighborhood as the buildings around it are mostly white and in a completely different style. Landakotskirkja is tall and dark with a flat roof and a large open garden around it. As you enter the church you will straight away notice the gorgeous flooring but the tiles are light-colored with pretty patterns. The ceiling throughout the church is about three-story tall and the windows narrow and high. They are decorated with colorful glass mostly in purple and blue. The altarpiece is a tall statue of Jesus on the cross, painted in bright golden colors. The church’s architect was Guðjón Samúelsson, the same as Laugarneskirkja and Hallgrímskirkja. Landakotskirkja’s style is Neo-Gothic. 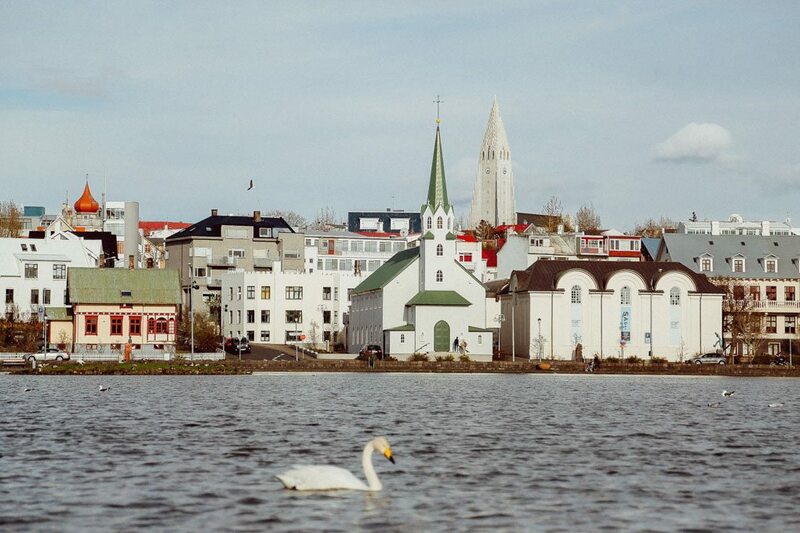 Fríkirkjan in Reykjavik is the very photographed white and green church that stands right next to the pond in Reykjavík’s center. The church only took 1,5 year in building and was inaugurated in the year 1902. The congregation was established a few years earlier and was somewhat of a statement to object certain aspects of the national church organizations. The 600 people who founded the church wanted to bring the church back to its people, hence the name ‘The Free Church’. At the time it was built Dómkirkjan – Reykjavík Cathedral was still the only church in Reykjavík. The building was raised in three different steps, the second step was to lengthen the church and the third to enlarge it as a whole. At this point, they built a chancel at the Eastern end and made various alterations at either side of the forechurch. When you enter the church you are greeted with an unusual amount of gold for an Icelandic church but the painting on the walls and the woodwork is excellent! The altarpiece is a large painting of Jesus and the wooden balcony at the right-hand side is stunningly carved. 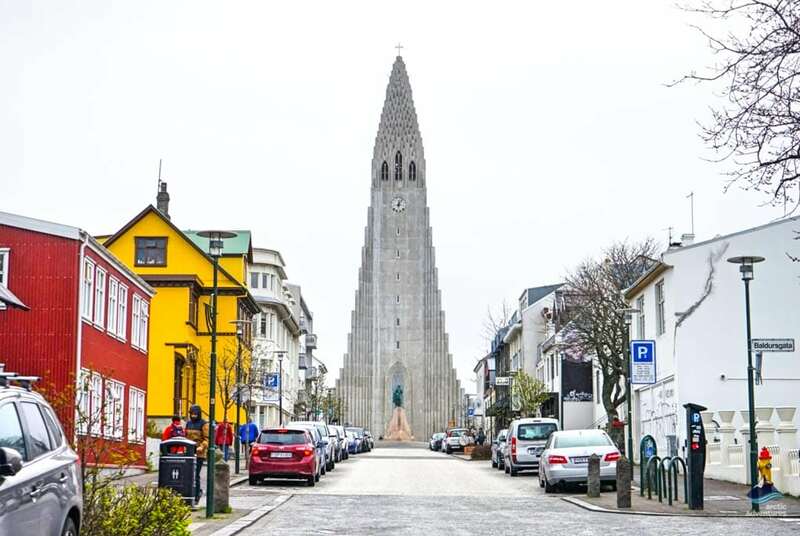 When anyone speaks of the Reykjavik Church, this is the one they are referring to. Hallgrímskirkja is the center point in downtown Reykjavík and without a doubt the most grandiose building in the area. Guðjón Samúelsson was the architect for the project and he is said to have found inspiration in the heavenly waterfall Svartifoss inside Skaftafell. If you compare the two, you can easily see how but the basalt columns surrounding the waterfall are displayed upside down at each side of the church tower. Hallgrímskirkja is the tallest church and largest church in Iceland and is most commonly chosen for any big church events. The name Hallgrímur is taken from Hallgrímur Pétursson, but he is one of Iceland’s most famous poets and wrote the Passion Hymns. The inside of Hallgrímskirkja is marvelous, but its organ is the largest organ found in Iceland. It has 02 ranks, 72 stops and 5275 pipes and is 15 meters (49 ft) high. The organ weighs over 25 tons. The organ was inaugurated in 1992 and was constructed by German organ builder Johannes Klais from Bonn. In Hallgrímkirkja’s lobby you can, for a small fee, take the lift up to the church tower. There you can see the church clocks up close and personal and stand in the tallest building in downtown Reykjavík with a view over the whole of Reykjavík. The windows are tinted in different colors so you can view the city with different filters but there is also a spot to see it in its original form. Hallgrímskirkja is incredible inside out and you will really have to work hard if you want to get a bad photo of it. Any angle, any season, any weather this stunning landmark will shine like the star it is. 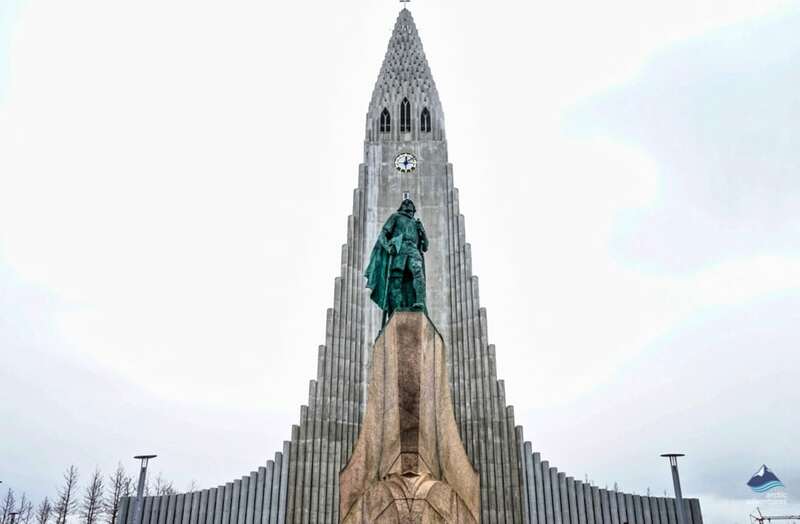 In front of the church, you will see a large statue of Leif Eiríksson, the Icelander who found Vinland (America) but i is safe to say that Icelanders are quite proud of him. 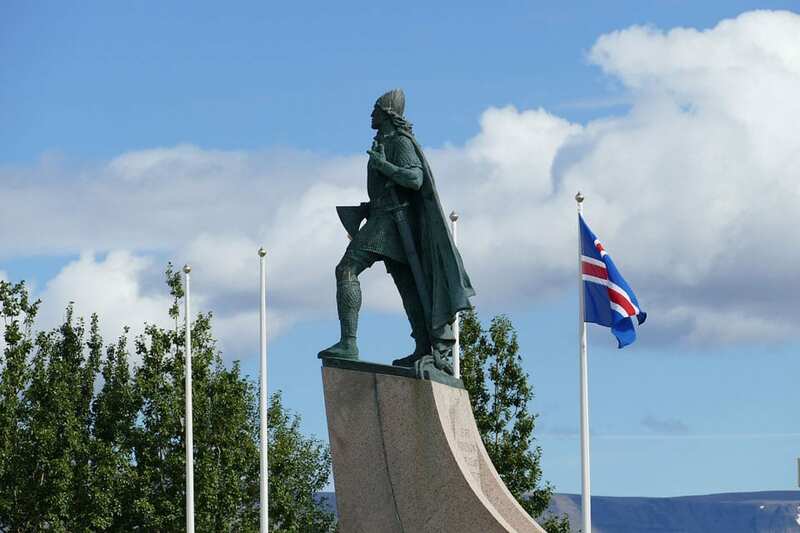 The statue was a gift from the United States in celebration of the 1000 year anniversary of the Icelandic parliament. Icelanders saw the gift as a sign that the United States now acknowledges Leifur Eiríksson as the one who found of America. Iceland is a very loveable country and has been like this for a while. We keep hearing the same old reasons again and again but Iceland isn't all that because of what happened in the older days. We are ALWAYS making up new and different ways to stay adorable. 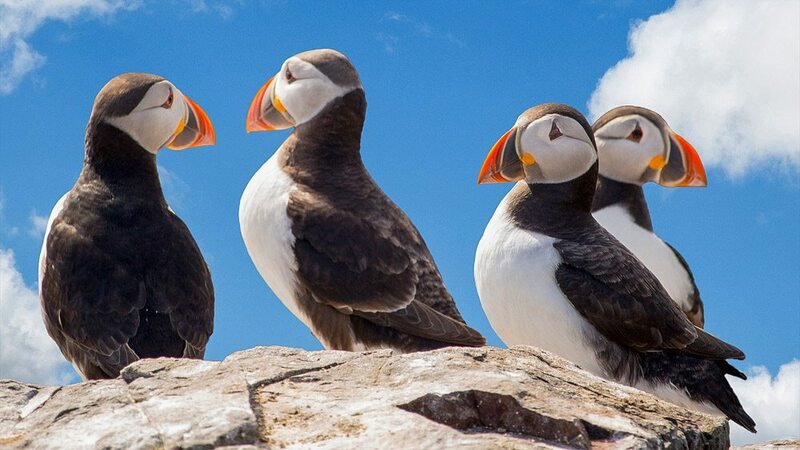 Here is a list of 6 NEW reasons that make all of us love Iceland. Iceland is a true waterfall paradise, everywhere you look, it seems, water is drizzling down in the most gorgeous streams you will want to stop and admire them for hours. Many know the famous Seljalandsfoss waterfall, Skógafoss, and Gullfoss but Iceland has so many others. Here is the list of 10 lesser known but equally as beautiful waterfalls of Iceland. How to move to Iceland? One of the most googled questions in the recent years. The fairy tale looking islands in the North is getting to be a popular travel destination, but what if you wanted to move to there? What do you need to do before moving to Iceland? 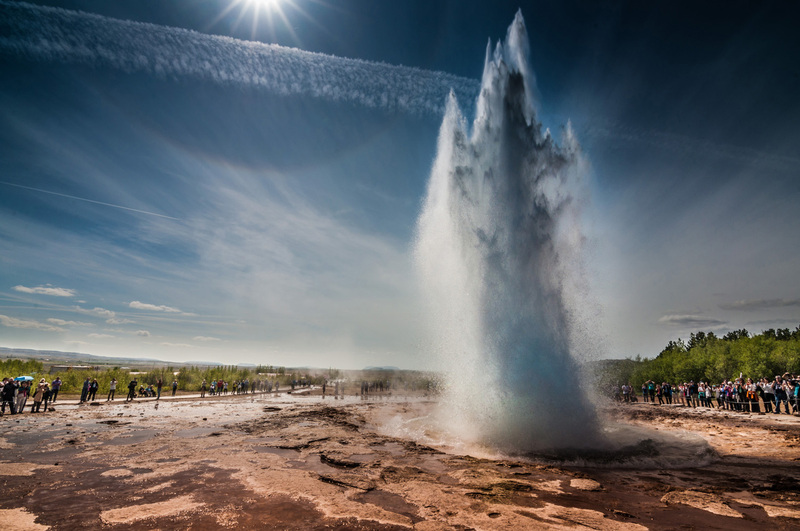 Here is everything you need to know before settling in Iceland.